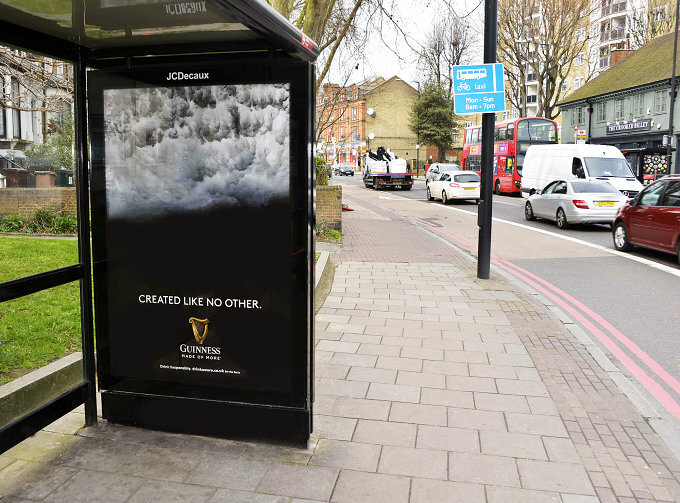 Guinness continues out-of-home innovation using behavioural data to locate and reach draught enthusiasts. Guinness has launched a highly targeted, out-of-home campaign for its iconic draught stout that uses data to reach Guinness fans based on their location, behaviour and affinity to the brand. Guinness messaging will appear on roadside digital six-sheets skewed towards these Guinness “behavioural hotspots” and be supported with a wider out-of-home campaign running on Adshel Live, LDN and Tesco SmartScreen networks and other retail POS sites in close proximity to on and off-trade stockists to stimulate consideration and purchase. Planned by Carat and Posterscope, in partnership with Locomizer, the campaign is a continuation of the ‘always on’ strategy that Guinness deploy in OOH, ensuring a presence throughout the year and during key cultural moments. Creative is by AMV. Alexa Wolff, Guinness Senior Brand Manager, said: “Guinness has always invested in out-of-home because of the rich creative canvas and brand building opportunities it offers, but the innovation we are seeing in the medium means it can offer even more. Now we can use multiple data sources to optimise our campaigns and reach audiences with a genuine interest in our brand, close to our stockists, increasing effectiveness”.